THE ITALIAN KEY is a Finnish English-language feature film about a 19 year old orphan named Cabella who is left homeless after her caretaker, Max, dies. Her only inheritance is a key to an empty, run-down villa in Italy. With nowhere else to go, she moves into the villa, makes new friends, and changes lives, including her own. The picture was filmed on location in the UK, Italy, and India. In the period before theatrical release, The Italian Key has already won several minor film festival awards, including the Las Vegas Film Festival , Honolulu Film Awards, and Feel Good Film Awards (Best Feel Good Feature Film). 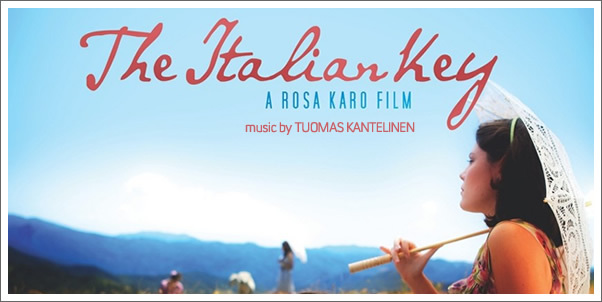 What is more relevant to this review is that THE ITALIAN KEY score by composer TUOMAS KANTELINEN also won the top honor (Outstanding Achievement) at the 2011 Park City Film Music Festival for both the director's and audience choices. This movie is about pulling heartstrings. The score, then, is the quintessential tearjerker, complete with weeping strings, pain-laden piano, and track titles like "Mother's Tears." When you think of a soundtrack to a sob story (homeless orphan, anyone? ), you can almost see a violin section magically spring up behind the storyteller. THE ITALIAN KEY would be that soundtrack. Most of the music tends to vacillate between affettuoso (with emotion) and lacrimoso (with tears). But it is a feel good movie after all, so the score thankfully also carries an infusion of hope and mischief, repeated just often enough to make it interesting.